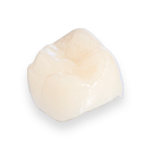 UTZirc (Zirconia Ultra High Translucent) offers a combination of enhanced translucency and flexural strength that helps create a natural and highly aesthetic result for your patient. This material is as translucent as lithium disilicate (and more translucent than monolithic zirconia) but has greater flexural strength than lithium disilicate. UTZirc is milled from a gradient block, which ensures a great base colour for optimal aesthetics; customers can choose from 20 shades (including four bleach shades). If adjustment is required, no colour change would occur. UTZirc represents an ideal aesthetic solution for both anterior or posterior crowns, and bridges of up to three units, as well as inlays and onlays.